The high demand for Albany’s bonds showed that the city’s financial position is sound. 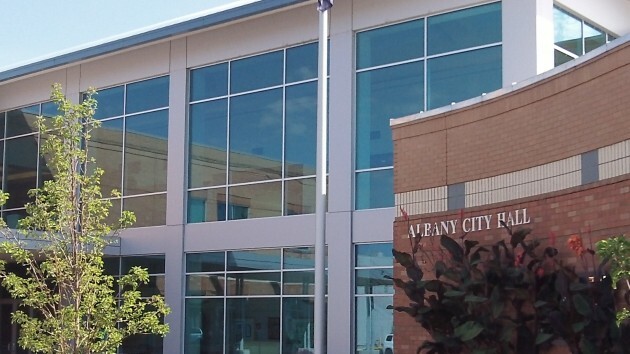 Albany officials were delighted with the results of Wednesday’s bond sale to pay for the planned new police headquarters and downtown fire station replacement. The high demand — 10 bidders — showed the strength of the city’s financial situation. As for me, I was a little puzzled, which once again shows that I’m mystified by the finer points of high finance. Voters approved a bond issue of $18 million. There were 10 bidders to buy bonds, and one of them, Mersirow Financial Inc., was awarded the sale based on a “true interest cost” of 3.115187 percent. To pay off the bonds over 20 years, property taxpayers in Albany will be charged an annual 29 cents per thousand dollars of assessed value, just as advertised before the May 19 election in which the bonds were approved. Total interest due over the 20 years will be $7,972,636, which the city says is $459,275 less than estimated before. So far so good. So, is the $594,785 received over the $18,000,000 face value a “profit” to the City? How will that amount be used? The $594,785 is “profit”? Doesn’t the city still have to pay back this money to the buyers of the bonds? If yes, the debt service would grow simultaneously with the increased loan amount. Correct? Or, is the city paying a higher interest rate to get the $594,785 premium? This should result in a higher yield and better cash flow to the bond buyer. Either way, it sounds like taxpayers are being stuck with more debt service costs. Correct? Thanks for helping us understand this situation. IF there is such “high demand”, why does the city feel “forced” to authorize a larger bond then the voters approved? IF they had guts and integrity, they would simply state that they are only authorized $18 million and would be LYING to the voters to accept any larger amount. Well, that’s nothing new. But the correct word is not “mystified”, it’s “ignorant”, as in you have no knowledge or understanding of municipal bonds or the bond market in general. Nevertheless, you go on to educate the rest of the world, with your ignorance, or shall we be kind and say, your radical right wing unknowing “spin”. When municipal bonds are issued they are issued at a face value, plus issuing costs, for a specific term and at rate believed to be a fair rate of return. When issued, the city is required to stand behind their offer as a contract that they must observe under the terms specified. No – more ignorance on your part. The terms are the terms as issued, on both the seller and the buyer. No wrong again.The terms are the terms as offered. You clearly don’t understand contracts. Why is it you make these wild assumptions without asking first? Yeah, I know – your aim is to tarnish the City of Albany, and all government, by attacking from you point of ignorance instead of gathering real facts first. Wrong again. Just wrong, wrong, and more wrong. What’s even more incredible, is that you have no idea of any kind how the free market works. When multiple buyers are trying to buy the same thing, someone is likely to pay MORE than someone else. Look at the housing market, like over there at Edgewater village where you berated the developer for not selling properties AT LESS THAN THE COST THE MARKET IS WILLING TO PAY! The same is true in the bond markets. When multiple buyers are involved, someone else is willing to pay MORE for the bond than others are. In this case, it looks like the City of Albany was able to get almost $600,000 more than the offering! That’s a windfall for the citizens who are the OWNERS of the City of Albany. Only a complete IDIOT would walk away from an extra $600,000 at no additional cost. So get this through your radicalism: Albany has been an exceptionally run city for decades as is evidenced by national financial awards they have received for around 30 YEARS now. The City of Albany rode through the worst economic recessions of our lifetimes by tightening their belts, encouraging folks who could retire to do so thereby saving jobs of the most vulnerable employees, all while safeguarding the public services that people rely on through minimal cuts. They kept their bond rating as others had theirs lowered. Don’t think so? Go back and see the turmoil that Corvallis had to go through. For decades Albany has, year in and year out, won awards for exceptional management. All the while you repeatedly tar and feather the innocent staff, the elected officials, and the citizens who disagree with you because of your unmatched ignorance and simple desire to attack government and all its parts. A bond is a bond, and the terms MUST be adhered to as they were stated in the offering. That includes the tax rates and schedules that the offer was based on. Now, the Council has an additional $600,000 that they can work with. But only within what the terms of what the offer included. That is the LAW. I think Hasso is probably right in that “saving” the Pepsi money for other uses will be a prime option. Well, as I admitted up front, I’m no expert on high finance. What puzzled me was the explanation that the bond buyers were willing to pay more, a premium, because they expect more income from interest payments as a result. If the bond amount is fixed and the interest rate is fixed, how do they get more income by overpaying for a bond? They get the interest, which they would not get if someone else had been awarded the bid, but by paying more to get the bond, they are out some cash up front. Seems that would lower their yield, not increase it. I eagerly await Bob’s answer to your question. And I’ll ignore Bob’s ad hominems and snarky comments. He looks pretty foolish with the false assertion that I didn’t ask questions first. My post was virtually all questions. And notice Bob ignored my question about the city paying a relatively higher interest rate. Bond buyers clearly expect a higher yield and increased cash flow over the life of these bonds. The only way this can happen is if the city pays a high enough interest rate to more than cover the premium the bond buyer will pay. In other words, the bond buyer profits more somehow over the life of the bonds while the city must incurs more debt service. Perhaps Bob can enlighten us how the city can avoid relatively higher debt service costs while at the same time the bond buyer reaps a higher yield and cash flow by paying a bond premium. Ball’s in your court, Bob. And let’s keep the personal attacks to a minimum, agreed? Those bond buyers are financial institutions that resell the bonds to other people for a profit. They have clients who want good, safe bonds. They know quite well what their clients are willing to pay and what teh current demand is. Municipal bond interest payments are tax free and sought after. They are traded back and forth every day and the value goes up and down according to market conditions. That the way the free market works. Right now, if you want to buy Greek government bonds, you can get them for WAY less than their face value because the Government may very well default – better to sell Greek Bonds for a fraction of the value rather than lose it all if they default. WOW Bob, you had the perfect opportunity to educate the voting public on the intricacies of bond sales and the mechanisms of the details in play here, as a gentleman. You failed miserably. Yet again you got personal with your political adversary and have now taken your condescension to a new, unprecedented LOW level and have deposited the most despicable post I’ve ever encountered on this blog, deserving of it’s place alongside whale dung, no matter how factual it might be regarding municipal bonds. You continue to pontificate where you don’t really have a dog in the fight since it’s clear you don’t even live in the Albany city limits and therefore are not subject to the TAXES you say we should be happy to pay, nor paying off these bonds we as taxpayers are obligated to pay back. It is clear you think you are the smartest guy on this site. Perhaps so, but you have ZERO social skills. ZIP, NADA, NONE! And you still haven’t answered the questions Hasso posed. I guess maybe you’ll just have to draw us all a picture, BOB. With regard to your Edgewater example, IT REMAINS TO BE SEEN what PRICE (not cost…talk about ignorant) THE MARKET IS WILLING TO PAY! A financial wizard such as yourself should know the difference between COST and PRICE…so why don’t you, BOB? Bob, you have ZERO class, delivered in the most classless way possible and I hope I never have the displeasure of meeting you. EVER!